Kento Momota made history for Japan today as he became the first home player to win the Men’s Singles title at the Japan Open. 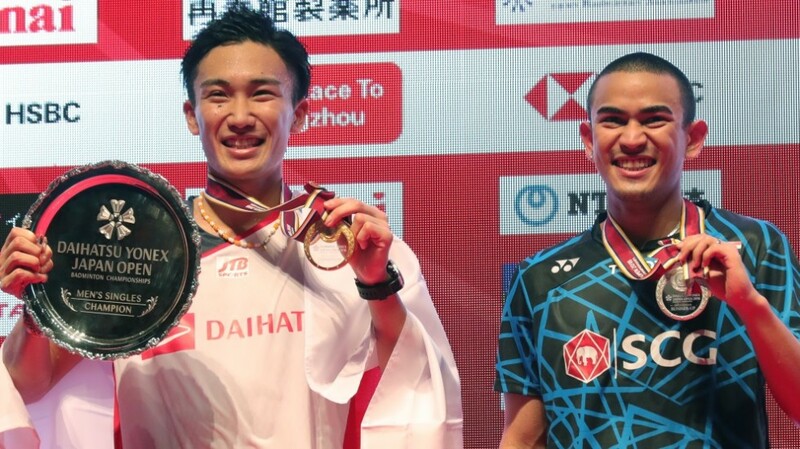 Momota’s stellar year continued as he followed up on his Asian title and the World Championships gold to win the DAIHATSU YONEX Japan Open 2018, an HSBC BWF World Tour 750 event. In the process, he halted the spectacular run of Thai dark horse Khosit Phetpradab, who had made his first major Men’s Singles final. 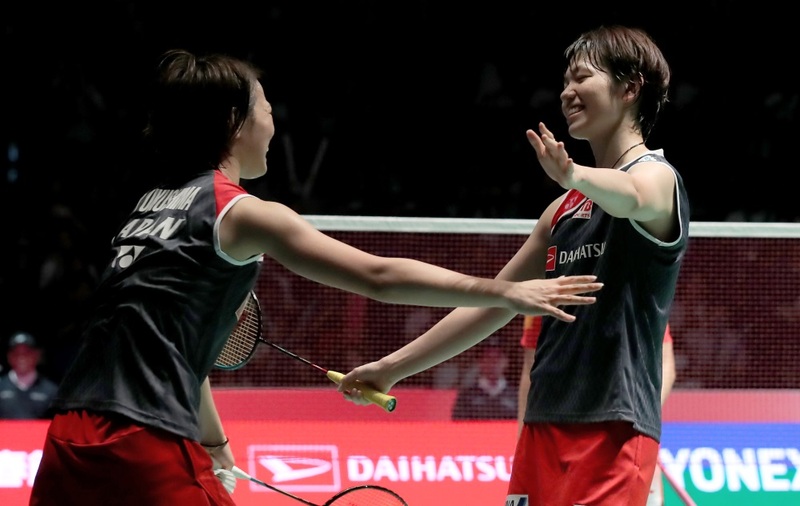 Momota’s was the first of two Japanese gold medals on the day, as Yuki Fukushima/Sayaka Hirota won the Women’s Doubles in the next match. However, Women’s Singles home crowd favourite Nozomi Okuhara was outgunned by World champion Carolina Marin (Spain). 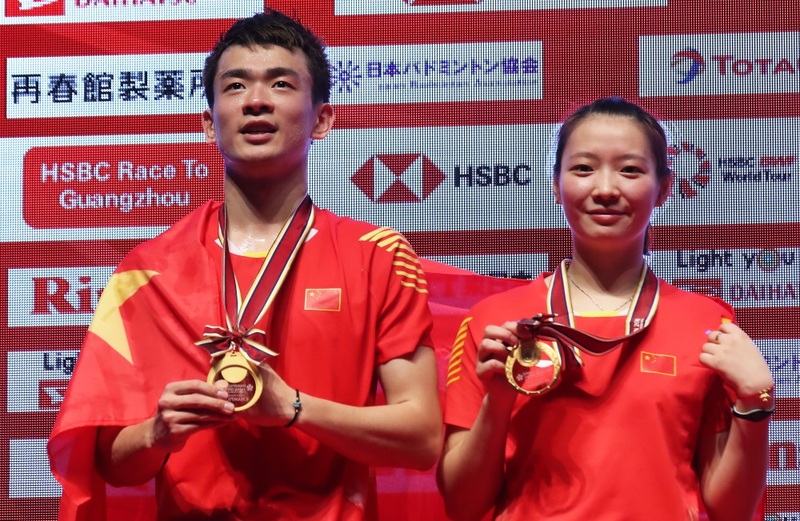 Marcus Fernaldi Gideon/Kevin Sanjaya Sukamuljo (Indonesia) and Zheng Siwei/Huang Yaqiong (China) continued their dominance of Men’s Doubles and Mixed Doubles respectively, with the Indonesians winning their sixth title of the year and the Chinese their fifth. Through the week, Phetpradab had showcased some fiery attacking badminton that had helped him shock All England champion Shi Yuqi and Olympic champion Chen Long in previous rounds. The in-form Momota, however, was a different prospect altogether. In sharp contrast to the way he’d started his semi-final against Denmark’s Viktor Axelsen, where he’d chosen to peg his opponent to the baseline, Momota turned up his own attacking volume. With Phetpradab too not backing down, it was an entertaining early session. Two things worked against the Thai – Momota’s classiness in anticipation, ensuring that certain winners were returned, and Phetpradab’s own tightness, following perhaps from the energy he’d spent getting to the final. Having drilled a crosscourt smash on the line to make it 14-16, Phetpradab served into the net; on the next point he went for a similar smash but went wide. The errors gave Momota the cushion he needed, and he continued in the same vein in the second. The Thai, to his credit, kept going, with another fierce smash helping him to 9-all. But then the errors returned again, and even though he sparkled at times, it was evident he wasn’t his best against a player who made barely any mistake of his own. 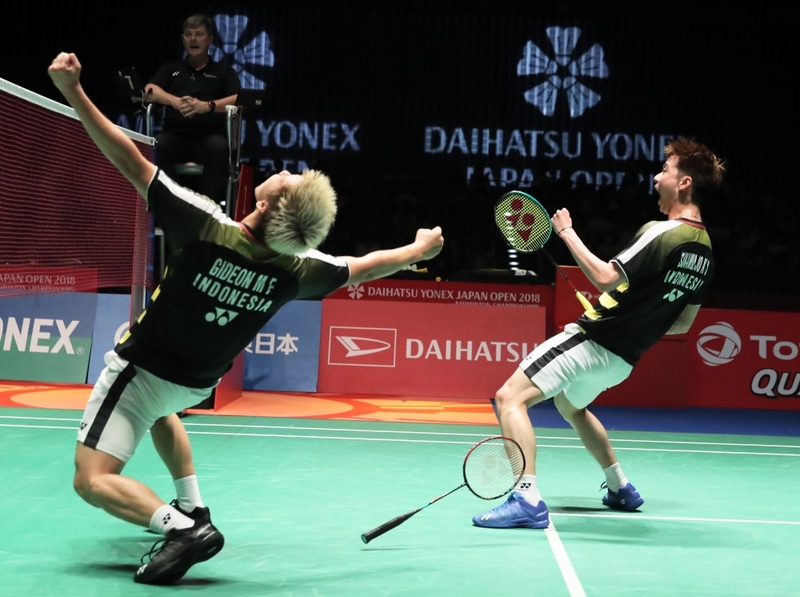 With a final crosscourt smash that went unchallenged, Momota sank to the floor – it was a more emotional celebration than at the World Championships. 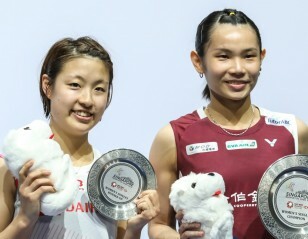 In the Women’s Doubles final, local hopefuls Yuki Fukushima and Sayaka Hirota stonewalled Asian Games champions Chen Qingchen and Jia Yifan, 21-15 21-12. It was a reversal of the result from the 2017 World Championships final. True to form, Fukushima and Hirota built a wall that Chen and Jia tried hard to pierce. With Fukushima’s probing attack from the back and Hirota’s powerful interceptions from the mid-court, the Chinese were constantly under pressure. Chen had to work hard to cover up for her partner at the back, and consequently her own level dipped. A phenomenal 83-shot rally that went Japan’s way gave them first game point. Midway through the second game both Chen and Jia were visibly flagging, and the Japanese scored a succession of smash winners by bisecting them. A final long rally won, and the Japanese had completed their conquest of their home tournament. Victory for Nozomi Okuhara would’ve meant an unprecedented three titles for the home team at the Japan Open, but it was not to be. In the longest contest of the day at 74 minutes, defending champion Carolina Marin kept her crown with a 21-19 17-21 21-11 result. Okuhara will look back at the missed opportunities in the first game that decided the direction of the match. The Japanese had significant leads through the game, only for Marin to claw back, staying with her punishing pace to draw the errors from her opponent. At 19-16, Okuhara was very nearly there, but Marin continued to push the pace and nicked it off her opponent. 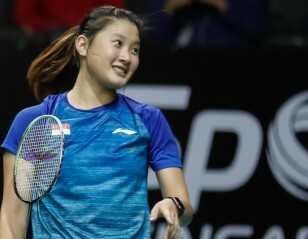 And while Okuhara did recover to level the deficit after a gruelling second game, the physical and mental effort showed up early in the third. Marin shot off to a 10-1 lead, and it was apparent that her opponent had nothing left in the tank. Li Junhui and Liu Yuchen, crowned World champions in August, didn’t live up to expectations. The Chinese pair – particularly Li, who had an awful day – were way below par, and Gideon and Sukamuljo were all over them. The Chinese pair started out without a sense of urgency, content to keep the shuttle high and invite the attack; neither were they threatening in the serve-return situations. It was only at the beginning of the second game that the Chinese reverted to their true style of playing, leading to some lively exchanges. Li’s mistakes, though – he was erratic in serve and sluggish in movement – gave the Indonesians enough opportunities to pull away to a 21-11 21-13 victor. This was their sixth title in 2018 from as many finals, and maintained their unbeaten streak in finals going back to October 2017.